It's not news that mobile OS giants, Android, have provided support for fingerprint sensing on phones from android 6.0 Marshmallow to allow supported phones utilise this security advancement. The problem is that most users of fingerprint-supported phones don’t know how to lock and unlock their phones with it. I will, therefore, in this post, show you step-by-step how to lock and unlock your phone in order to secure your confidential information and other classified documents. Before we move on, I had like to show you what you can achieve with the fingerprint sensor on your smartphone. What can you achieve with the fingerprint Sensor? The idea behind the development of fingerprint features on mobile phones is to help users carry out some functions faster and easier. This allows users to perform several operations with just a finger and a hand’s grasp of the device. Some of the things you can do with this emerging solution have been highlighted below. Just with one of the scanned fingers, you can achieve much – receive incoming calls. To pick, accept or receive incoming calls on your device, simply long press the fingerprint sensor while your phone is ringing. By doing that, the call will be automatically accepted or picked. This is awesome, quicker and convenient. You can overcome major interface challenges with this feature. For instance, devices with malfunctioning or bad touchpad will prove difficult to accept calls, but with the fingerprint sensor at the back, you can accept such calls. Similar to tapping the camera button on your device, you can take photographs by tapping the sensor. Also, selfies can be captured by flipping the camera to the front and then tapping the sensor. This is most important for selfies, as just a finger is enough to capture your moments with friends without stress. Unlike the conventional front tapping function or Power and Volume Down buttons techniques, this is more convenient to use. More fun is experienced while viewing pictures in full mode. With just a finger-swipe on the sensor, you can browse through all the photographs stored in a particular directory. Just swipe left-to-right or right-to-left to watch these photographs ‘magically’ and sequentially. Do you intend to recall an ongoing conversation on your phone and don’t want to take the phone away from your ear before doing so? Then this is a better solution. While receiving a phone call, long-press the fingerprint sensor to start recording immediately. Do the same to stop recording the call. Have you seen a faster way to dismiss alarms? Whether yes or no, this is just the truth about stopping alarms. The fingerprint sensor grants you the ultimate solution to dismiss alarms once your device starts blaring. Once on the alarm response interface, touch the fingerprint sensor to dismiss the alarm. This will save the time of attempting to swipe through your phone’s touchpad which sometimes causes a snooze instead of dismissal. Prevent unauthorised access to your information and files. This is the major security benefit that the sensor offers. In combination with other security features, fingerprint sensor opens up a reliable avenue to keep your information safe and secure. Despite the research analysis of a 60% chance of by-passing this security feature with master prints, it grants stronger and reliable security to mobile phone users. Think of just a finger press to unlock your device after locking it conventionally. The good news is that it combines perfectly with the phone’s default security methods – pattern, pin, and password. Recently, much effort has been put into developing mobile devices that support and make use of fingerprint scanner. Most of these phones are economically viable and come with excellent smartphone features you had love to see. You can check out Infinix Hot 4 Pro, Infinix Hot 5, Nokia 8, Tecno Spark K7, Tecno Spark K9, Gionee A1, Nokia 2 or simply visit an online mall (affiliate link) for more – I have sorted out these phones to help you browse through them easily. By now, you are ‘itching’ for things to get popped so that, on the fly, your fingerprint security feature can start performing. Well, it’s a nice feeling because you’re going to do just that by the time you go through this section. It’s really simple to set up and manage. Using fingerprint security on your phone requires a security setting, first. Be it a Pattern, Password or Pin, set up one. There is no preferred or best method, it’s just a matter of choice and preference, though patterns appear to be the most used. The rule is clear, use the one you prefer and that is easier for you to access. If you haven’t set up any security function on your phone, do so. Access the Settings of your phone, scroll down and tap Security. Next, select your preferred screen lock security method and provide the necessary details. To be on the safe side, create a recovery means by providing an answer to a security question you can remember when need be. Now move on to create a fingerprint account. Access the fingerprint management feature. You can access this feature by opening Settings and swiping down. Tap on the Security setting and then Fingerprint. 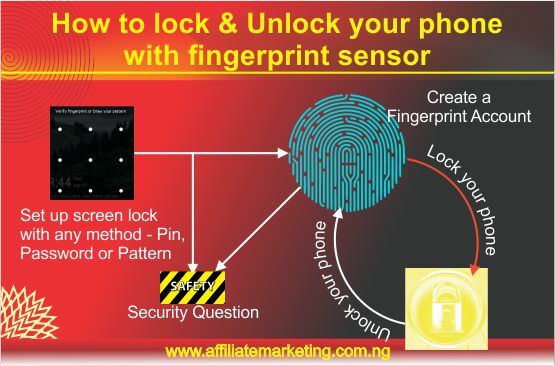 Alternatively, browse the apps on your phone for Fingerprint app usually represented by scanned prints. Tap on the icon to access the management interface. Any method you use, ensure that you are on the management interface where you will create and set up your account. If you have an existing fingerprint account, move to #3, otherwise, tap Create fingerprint to continue. Follow the instruction to place some of your fingers on the sensor. Once each finger is scanned, you’ll be instructed to lift it and place a finger again. You might want to capture every area of a single first before scanning another. This will improve the chances of the sensor recognising your prints from several areas of the fingers used. Tap the Finish button to complete the setup. On the next interface, create a recovery process via a security question. Select a question and provide an answer you can remember. This will be useful when you, somehow, forget your password, pin or pattern. To lock the screen of your phone, turn on Unlock screen. The same can be applied to Access xHide for phones that support xHide security feature, and Access app lock. Next, return to the Fingerprint interface and activate the following features, though optional. Take a photo, Accept call, Browse pictures, Call Recording, and Dismiss alarm. Anyone you activate will be ready for control by the sensor with just a finger. Finally, we have done our groundwork by creating a fingerprint account and have provided a recovery system. It’s now time to prevent unauthorised access to our devices. Note that there are other things you can do with the sensor aside locking and unlocking your phone. Return to the first section – What can you achieve with the fingerprint Sensor? – to brush up on other things. If you’ve activated the lock screen security feature on your device already, press the power button once to lock the screen and test-run your new security feature. As we all know, pressing the power button sharply will cause the screen to lock. Now, attempt unlocking the screen as usual. What do you notice? An authentication interface, right? Yes. For first use, you’ll have to authenticate your security details by providing the correct password, pin or pattern – depending on the one used on the device. Next, lock the screen again using the power button on the side or top of the phone. To unlock the phone this time around, place one of the scanned fingers on the fingerprint sensor located at the back and wait – for some seconds – until the phone unlocks. You got it! If yes, then kudos! Enjoy the excitement and share the experience with your friends. Still having challenges with setting up the lock and unlock feature, go through the post again. This time around, be careful to grab all the details and follow the instructions provided here. Otherwise, use the contact form to send me a message and I will be willing to help you overcome the problem. There are times when you’ll need to unlock your device using your chosen security method – whether a pattern, pin or password – especially when there have been failed attempts to unlock the phone. Or, when someone has repeatedly tried to gain access using wrong security details. At such periods, your fingerprint security system will require authentication via the default security method. Therefore, often use the authentication details you can always remember, and most importantly, use this authentication method periodically to help you remember the details. There is, however, a lifeline – recovery question. I don’t advice complete reliance on this except you are familiar with the answer to the question. For instance, you might use it once in a while causing your memory to gradually forget what the correct answer is. Avoid using uppercases as answers to recovery questions. After a while, it might be difficult to remember which letter was capitalised, or if you actually capitalised the answer. Now, it’s over to you. You can choose to make things easier by setting up and using a fingerprint account or simply ignore. The truth remains that if you set up this security feature, you will be glad you did. The ease with which you can accept calls, take photographs, browse pictures, and dismiss alarms is worth considering.